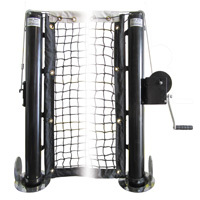 Sentry™ Pickleball Post System | First Team Inc.
First Team introduces the SENTRY™ pickleball post system. Sentry is the first pickleball set to feature the ability to quickly switch from pickleball to tennis on multi-use courts. The Sentry top cap telescopes up or down with just the pull of a pin to quick change net height from 36" pickleball to 42" tennis. The unit is constructed of 3.5” OD heavy duty, ¼” thick high tensile aluminum. 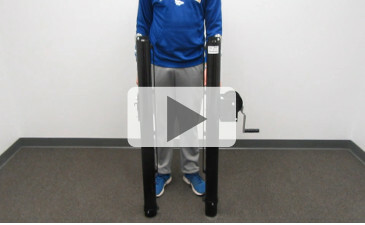 Aluminum construction makes these posts easy to remove and store, or reset for tennis if desired. 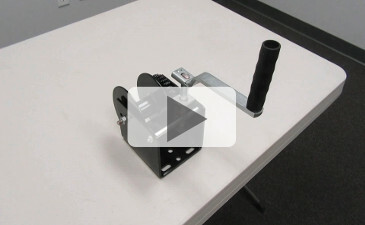 The heavy duty worm gear driven winch is easy and safe to operate and has a quick detach removable crank handle. Sentry package systems include a heavy duty, pickleball net made from the same high quality components we use on our tennis nets. Choose from Sentry two system options: SENTRY PKPS includes standard PVC sleeves for post installation while SENTRY PKSO includes our exclusive sockets with hinged cover lids. These sockets are particularly useful on multipurpose courts where a smooth flush surface is desired when posts are removed.